We are excited to get rolling with a great new year ahead and we hope you are too! 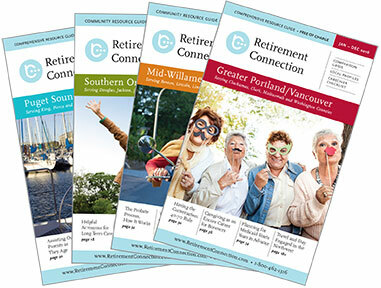 The new annual edition of the Portland/Vancouver Retirement Connection Guide has already hit the streets and we are currently distributing to every hospital, senior center, library, area agency on aging and meals on wheels site. Four copies have been mailed to every physician's office and four copies sent to EVERY company listed. Sponsors, a box of new guides will arrive at your office soon. Let us know if you don't see yours within the next few days! With the new guide on its way, there's nothing left to do, but celebrate! I hope you will join us at the January 26th Portland/Vancouver Release Party as we raise a glass to say thank you to all the people who helped make this guide possible and celebrate the beginning of great new year together. Please join us for the networking event of the year! Enjoy great wines and hors d’oevres, pick up copies of Retirement Connection Guide and register for fabulous prizes. This is an open event and all are welcome to attend so please feel free to invite your referral sources and other guests. I found that my feeling of reward is very closely tied to my effort. Sometimes I don’t always appreciate a “big” win that was easier than expected. I see the same in my children. Hard works makes the reward more meaningful and valuable.